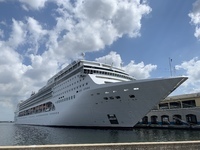 Review - Cabin 9004, MS Opera I approached this cruise with some trepidation, I’d read dozens of negative - some scathing - reviews of the MS Opera here on Cruise Critic. I figured that there were more than fifty negative reviews for a ship that carries over two thousand passengers a week, I’d brazen it out. I was pleasantly surprised. My cabin steward was cheerful and friendly, despite working stupidly long hours. My cabin was always spotless, serviced morning and evening. I read complaints that the MS Opera was looking tired and poorly maintained; I saw no evidence of that. Instead I saw crew members tirelessly painting and polishing the ship. Similarly, I’ve read negative comments about the waiting and bar staff. I’ll deal with them separately if I may., Waiting staff in the main dining room and buffet - I could not fault the waiting staff in either. They were always attentive and eager to serve, with a smile, even the most challenging passengers I experienced. Bar staff - a slightly different matter, in the bars I visited - and I tried most - the staff did their best to service customers although, to be honest, a few more bar staff would have not gone amiss, particularly at the ‘Spinnaker’ bar on the pool deck on ‘sea days’ or sailaway parties. Service improved markedly when more senior staff appeared on deck. On occasion I sent cocktails back, as there was little evidence of the purported spirits I have also read criticisms of the food. 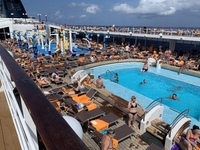 I tried the buffet restaurant, the burger and pizza offerings, while I enjoyed dinner and breakfast most days in the ‘La Caravella’ restaurant, on a Deck 5 at the aft of the ship. Some have complained about cold food, I never experienced that, and while the portions weren’t huge, there was always the opportunity to ‘top up’ - the ‘Caribbean Selections’ offered would be three prawns/shrimp or scallops - tasty but not exactly filling. 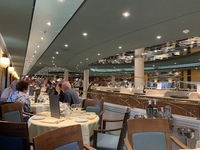 Towards the end of the cruise several diners on my table ordered multiple main courses. I can, however, recommend the ‘Eggs Benedict’ at breakfast time in ‘La Caravella’. 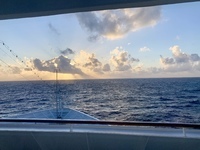 Back to the burgers and pizza, no complaints there, several people I spent time praising both - while they sitting writing lists of complaints about other features of the cruise. Entertainment - the evening shows in the theatre range from cheesey (Dirty Dancing), worthy (Opera and violin recitals) through to exciting (flamenco) and bizarre (acrobats). Daily entertainment in the pool area near the ‘Spinnaker’ bar was ‘Hi Di Hi’ type games during the day, while in the evenings the ‘bands’ were overly loud, it was difficult to hold a conversation anywhere near. On board internet is expensive, but it worked most of the time, there were times of increased contention when response times became unacceptable. Reasonable, but could do better. 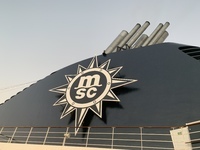 Overall, while others sat comparing MSC unfavourably to Royal Caribbean or P&O, I quite enjoyed the ship. Yes there are areas that could be improved, but most travellers had a great time. View from Cabin 9004 - "Front of the Bus"
I approached this cruise with some trepidation, I’d read dozens of negative - some scathing - reviews of the MS Opera here on Cruise Critic. I figured that there were more than fifty negative reviews for a ship that carries over two thousand passengers a week, I’d brazen it out. My cabin steward was cheerful and friendly, despite working stupidly long hours. My cabin was always spotless, serviced morning and evening. I read complaints that the MS Opera was looking tired and poorly maintained; I saw no evidence of that. Instead I saw crew members tirelessly painting and polishing the ship. Waiting staff in the main dining room and buffet - I could not fault the waiting staff in either. They were always attentive and eager to serve, with a smile, even the most challenging passengers I experienced. Bar staff - a slightly different matter, in the bars I visited - and I tried most - the staff did their best to service customers although, to be honest, a few more bar staff would have not gone amiss, particularly at the ‘Spinnaker’ bar on the pool deck on ‘sea days’ or sailaway parties. Service improved markedly when more senior staff appeared on deck. I have also read criticisms of the food. 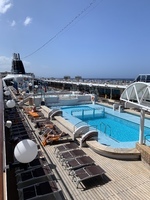 I tried the buffet restaurant, the burger and pizza offerings, while I enjoyed dinner and breakfast most days in the ‘La Caravella’ restaurant, on a Deck 5 at the aft of the ship. Some have complained about cold food, I never experienced that, and while the portions weren’t huge, there was always the opportunity to ‘top up’ - the ‘Caribbean Selections’ offered would be three prawns/shrimp or scallops - tasty but not exactly filling. Towards the end of the cruise several diners on my table ordered multiple main courses. I can, however, recommend the ‘Eggs Benedict’ at breakfast time in ‘La Caravella’. 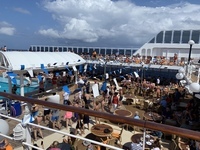 Back to the burgers and pizza, no complaints there, several people I spent time praising both - while they sitting writing lists of complaints about other features of the cruise. Entertainment - the evening shows in the theatre range from cheesey (Dirty Dancing), worthy (Opera and violin recitals) through to exciting (flamenco) and bizarre (acrobats). Daily entertainment in the pool area near the ‘Spinnaker’ bar was ‘Hi Di Hi’ type games during the day, while in the evenings the ‘bands’ were overly loud, it was difficult to hold a conversation anywhere near. On board internet is expensive, but it worked most of the time, there were times of increased contention when response times became unacceptable. Reasonable, but could do better. 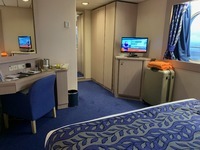 Overall, while others sat comparing MSC unfavourably to Royal Caribbean or P&O, I quite enjoyed the ship. 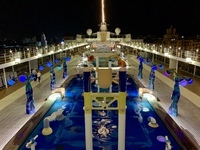 Yes there are areas that could be improved, but most travellers had a great time. 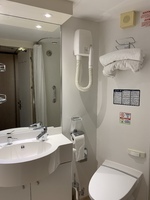 9004 - which was larger than I’d expected; with a bathroom that, while not huge, was large enough to be comfortable. 9004 lies at the front of the ship, beneath the bridge, so it was like travelling upstairs on a double decker bus, and those who remember that will know how satisfying that can be. The double bed was comfortable, there was ample cupboard space and plenty of hangers in the wardrobe. I didn&apos;t venture far beyond the port area, it didn&apos;t impress. I met with an old school friend who showed me round. I found Grand Cayman to be charming. I took a bus from the Ship, and wasn&apos;t overly impressed with Montego Bay. We took a taxi to the Argentine Grill in West Bay... a great experience, highly recommended.